This might come as a surprise, but we don’t really know what our own galaxy looks like. We can only see it from our lonely point in space, and we can’t leave it to get a picture from up above. Scientists want to change that—and they’re getting closer. 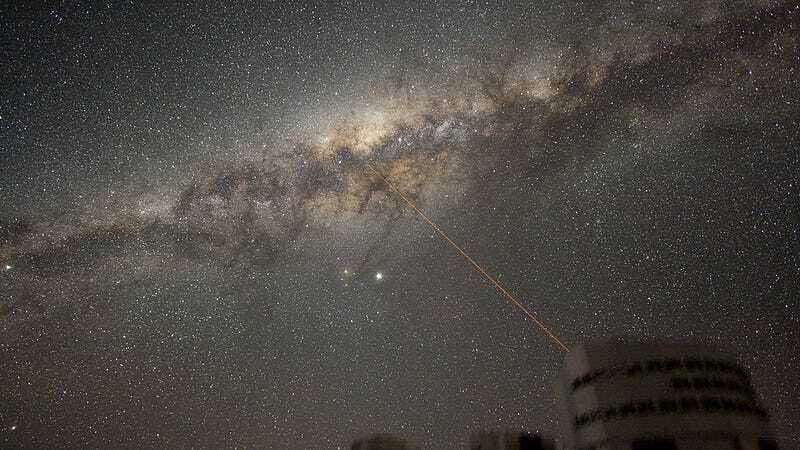 A team of researchers in the United States and Germany are now reporting the deepest look into our Milky Way yet: around 20.4 kiloparsecs, over 60 thousand light years. The galactic center scatters incoming visible light, so the researchers used special radio telescopes in order to spot their source. The newest research is part of a larger effort to map our home turf. The researchers used the Very Long Baseline Array, ten radio telescopes in New Mexico that act sort of like one very large telescope. These telescopes could detect the radio waves from the distant source, called G007.47+00.05, as they pass behind the dust of the galactic center (radio waves are a kind of invisible light that don’t get scattered by the dust). The team published its work yesterday in the journal Science. The key to observing such a distant point was figuring out trigonometric parallaxes. This might sound technical, but Sanna told me to just think about putting a finger in front of your eyes. Close one eye, and your finger is in one spot, close the other eye and your finger is in another spot. Combine the images and you can figure out the distances. In this case, the two eyes were the Earth’s locations around the Sun during different times of the year. “By simple geometry you can directly measure the distance from the Sun to the object you are observing,” said Sanna. Ultimately the researchers would like to combine more of this data in order to map the Milky Way and understand the structure of its spiral arms as part of the Bar And Spiral Structure Legacy (BeSSeL) Survey. Other astronomers, like Debra Elmegreen at Vassar, told Josh Sokol at Science that this a major advance. The BeSSeL team isn’t the only ones trying to map the galaxy. Next year, the European Space Agency’s Gaia probe will release coordinates from a billion stars across the Milky Way, writes Sokol. Still, Gaia mainly looks at optical light, leaving a blind spot through the brightest, dustiest parts of the galaxy.